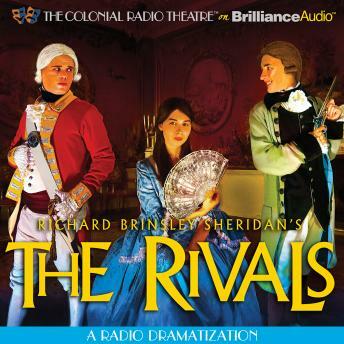 The Rivals has been delighting audiences since its very first presentation at London's Covent Garden Theatre on January 17th, 1775. The idealistic Lydia Languish, reads nothing but romantic novels, and in doing so, believes she can only find true love in the arms of a man without wealth. Captain Jack Absolute has fallen in love with her, and pretends to be a penniless ensign to win her heart. Coming between these two lovers are some of the most extraordinary comic characters ever to grace a stage; the autocratic Sir Anthony Absolute, the misspeaking Mrs. Malaprop, the fiery Irishman from Clod hall - Sir Lucius O'Trigger; and poor Bob Acres, a country squire who finds himself with a dueling pistol in his hand. One of the funniest late-Restoration comedies, "The Rivals" has spanned the centuries, and will continue to do so.